You can earn 55 yards with this purchase! Shows frequent to heavy use but does not show any signs of abuse. Cosmetic blemishes are clearly visible and may include: pop-up marks, heavy scuffing and scratching, paint chipping, heavy finish wear, shaft burn and pitting, natural dings/nicking/gouges, etc. If you can get past the cosmetics, there is plenty of life still in this one!...plus, get it for a steal! 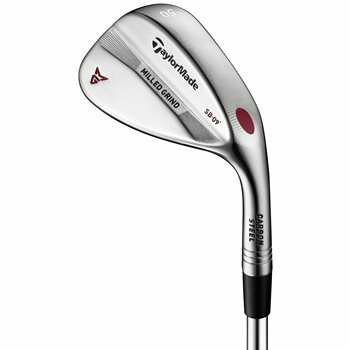 The TaylorMade Milled Grind wedges set a new standard in precision and feature up to 3 different bounces for a given loft. With new CNC machined sole geometry and a precise leading edge, this wedge inspires a lot of confidence at address. New ZTP-17 grooves and a precision weight port to lower CG maximizes spin and gives you an unprecedented amount of control around the green. The Low Bounce is designed for firm turf and sand conditions, and a sweeping shallow swing. The Standard Bounce is designed for moderate turf and sand conditions, and a standard swing. The High Bounce is designed for soft turf and sand conditions, and a steep swing. Review by pa, 21 days ago. Email verification required to report. I want this in a High Bounce (HB) buy your picture shows a Standard Bounce (SB). Do you have this sand wedge in the High Bounce, 13 degree bounce, right hand? You should be able to change the bounce to the 13 degree option to see what is available. Note pictures are representative of brand and model only. How much is the golf club that has been used?